Mrs Beeton sounded a note of caution concerning the use of wallpaper. Her focus was the bedroom. ‘Care should be taken,’ she wrote in The Housewife’s Treasury of Domestic Information, ‘to avoid any outré forms which the eye of a restless invalid, condemned to many hours of solitude, could torture into a form or a face of demon or grotesque horror.’ For today’s decorator, rediscovering the beauty and versatility of wallpaper after long years during which decorating trends largely ignored flat pattern, it’s a timely reminder that wallpapers have frequently been more than a background for living. 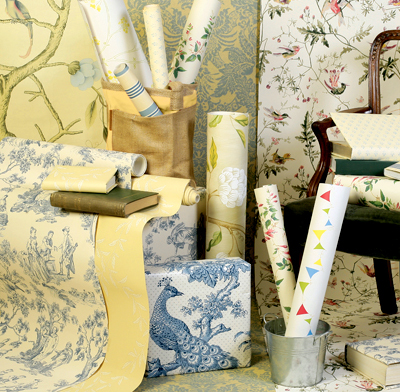 The current resurgence in wallpaper is part of a long and colourful decorating tradition. Generations of schoolchildren were patriotically misinformed that it was wallpaper, not cancer or over-frequent enemas, that ultimately killed Napoleon; Oscar Wilde, fighting a duel to the death with his wallpaper, inevitably admitted defeat; even William Morris, that colossus of 19th-century pattern-making, owes his grass-roots immortality to wallpaper-his Willow Bough of 1887 remains in production today, 123 years after it first transformed the interiors of a sooty, industrialised nation. An exhibition at The Whitworth Art Gallery in Manchester, ‘Walls Are Talking: Wallpaper, Art and Culture’ (until May 3), demonstrates that wallpaper-so often boring, bland or banal-has the potential to shock, inform and inspire. Its artist-designed papers address issues from toxic waste to domestic violence and AIDS. This is not as superfluous or trite as it may sound. Abigail Lane explains her motivation in creating Bloody Wallpaper, based on a photograph from the NYPD files of the bloody handprints made by a murdered woman struggling to escape her assailant: ‘Through the decorative nature of patterns, repetition can sometimes mask something uneasy.’ As Mrs Beeton apprehended, wallpaper affects the viewer at a more than visual level. Its possibilities are uplifting, as well as potentially challenging. Dominic Evans-Freke is the director of hand-painted wallpaper company de Gournay, which has reinvented 19th-century Chinese ‘tree of life’ papers. He describes the colour and pattern that characterise de Gournay wallpaper as ‘the essence of life, fun and happiness’. Wallpaper has a relatively short history. Essentially an 18th-century invention, it won influential devotees, among them Louis XV’s spendthrift mistress, Madame de Pompadour, who used it in the dressing areas of her private apartments at Versailles. From the outset, the appeal of wallpaper embraced both pattern and texture: early hand-block designs had a three-dimensional quality lost in the processes of modern mass-production. Flock wallpapers created an affordable alternative to fabric hangings and reproduced the damask patterns previously associated with silk and velvet wallcoverings. The 18th-century French designers developed large-scale scenic papers and transferred the engraved designs of toile de Jouy fabrics to wall-paper. Frequently, such papers displayed a topical interest, which ensured the trade remained ‘fresh’-from images inspired by popular literature to politicised imagery such as Jean-Baptiste Huet’s French Revolution toile of 1792, in which pretty-seeming vignettes incor-porate guillotines and their victims. DVD playback of the big day. Executed in tertiary shades of molten toffee and buff pink, its well-meaning charms must have challenged all but the most diehard royalist. Little surprise, then, that, in such a context, the designs of William Morris achieved instant popularity. Drawn from nature, Morris’s patterns helped to inspire a widespread nostalgia for England’s fast-disappearing rural past-just as, less than a century later, Laura Ashley’s small-scale flower and sprig wallpapers triumphantly banished the psychedelia and shiny surfaces of 1960s Modernism. It was, in both cases, an acknowledgement that wallpaper, far from simply providing a background for furniture and decorative objects, can make a direct appeal to hearts and minds. This element of fantasy is among the perennial attractions of well-designed wallpaper. In 2008, internationally renowned paper conservator Allyson McDermott completed the restoration of 20 rolls of mid-18th-century ‘India paper’ hung at Harewood House in 1769 under the direction of Thomas Chippendale. Lining the East Bedroom, the paper a fantastical kaleidoscope of old Canton-is the room’s principal glory, more exuberantly beautiful even than the contemporary green japanned furniture Chippendale designed as its partner. It offers a vision of an Oriental neverland bright with mineral pigments and eternal sunshine. Mrs McDermott has since launched her own ‘East India’ range. This element of decorative bravura remains a reason why today’s designers are again choosing wallpaper. At de Gournay, where every panel of wallpaper is bespoke and therefore unique, the company has witnessed continuous growth throughout the current economic downturn. The papers of de Gournay make no concessions to timorous decorating or the widespread predilection for neutral colours. As Mr Evans-Freke explains: ‘A typical project may involve yellow, pink, red or deep blue-but never taupe.’ Historically inspired, de Gournay papers are not slavish reproductions of earlier designs. At Guinevere Antiques in London, the loo is lined with an Art Deco-inspired de Gournay design of monkeys in branches. For the eagle-eyed, there are even portraits of the shop’s owners amid the simian frolics. This is wallpaper as the main event-like Harewood’s ‘India paper’, or the early19th-century Chinese Export papers at Belvoir Castle, which the Duchess of Rutland is currently raising funds to restore. As early as 1839, a popular magazine begged that artists involve themselves in the design of wallpapers: ‘Surely good artists may be found… who will stoop to lend assistance to such undertakings!’ Today, professional designers devote their whole lives to creating good-looking wallpapers that flatter both a room’s architectural contours and its contents. Manufacturers continually exploit new technology to create novel designs, from metallic papers to linen flocks. Interior designers are discovering again the role papered walls can play in creating handsome rooms. And dedicated conservators are restoring to their former glory historic wallpapers in Britain’s great houses-bringing the background triumphantly to the fore. rollers to create decorative candles a sort of wallpaper fix in miniature.